Discussion in 'Food Corner' started by Ishi, Aug 21, 2018. Growing up mom always had dried beef in the fridge but with the high price for it now (10-13$ a pound ) it not feasible to buy. I scoured the web and found a recipe and the gentleman has been very helpful with info. I feel its a must try cause the results are so good. Just save some backstraps or roasts for the cook. 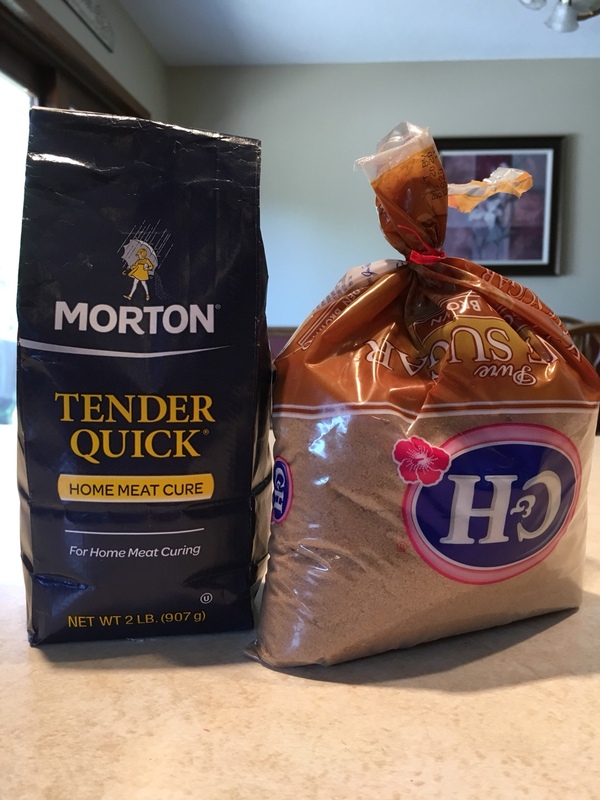 1 TBS Brown Sugar per pound of meat, it’s that easy! Weight the meat and apply the required amount of TC evenly then apply the Brown Sugar and place it in a ziplock bag. Place the meat in the fridge 37-38 degrees optional curing temps. I’ve done three batches and I like the meat to be no thicker then 2 1/2-3 inches. Let it cure for 8-9 days and flip the bag daily. After curing rinse throughly under the faucet. I don’t even bother doing a test fry now as it perfect for my liking. Dry with paper towels the best you can and sprinkle CBP on the meat. Place in fridge for 1-2 days uncovered to dry the meat out. Smoke low and slow until it hits 150-160 IT. After the smoke allow the meat to cool then wrap in plastic and let it set for 1-2 days in the fridge. I personally like this better then Pastrami or jerky. 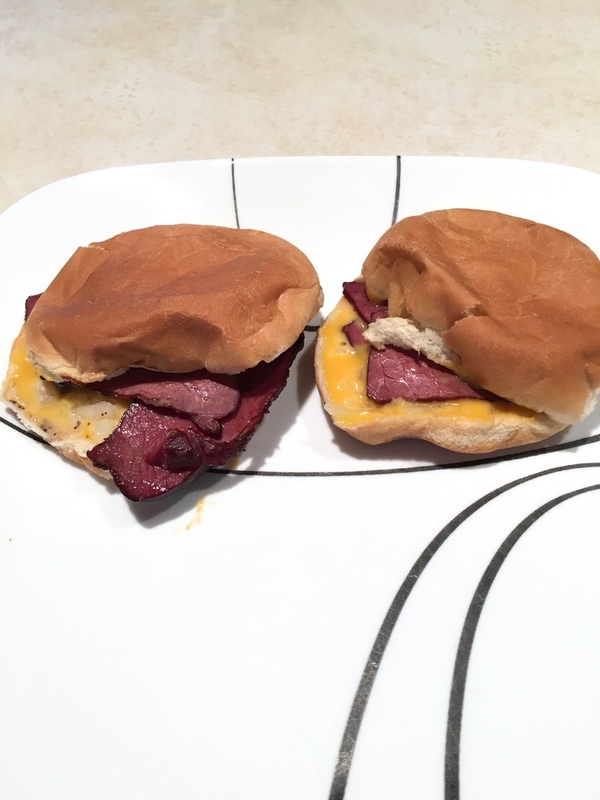 Made these Sammie’s on the grill. 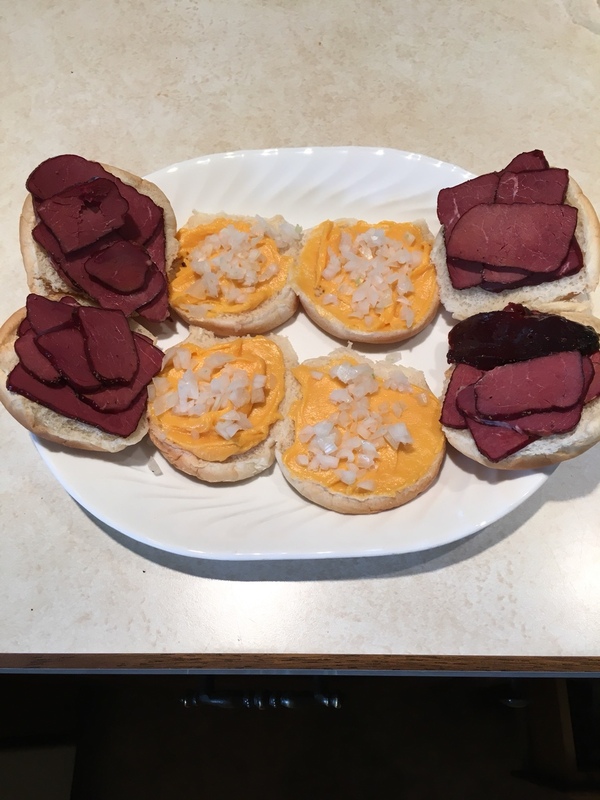 Cheese Wiz, finely chopped onions, and Dried Deer. Wrap them in tinfoil and warm them up in the oven or grill. 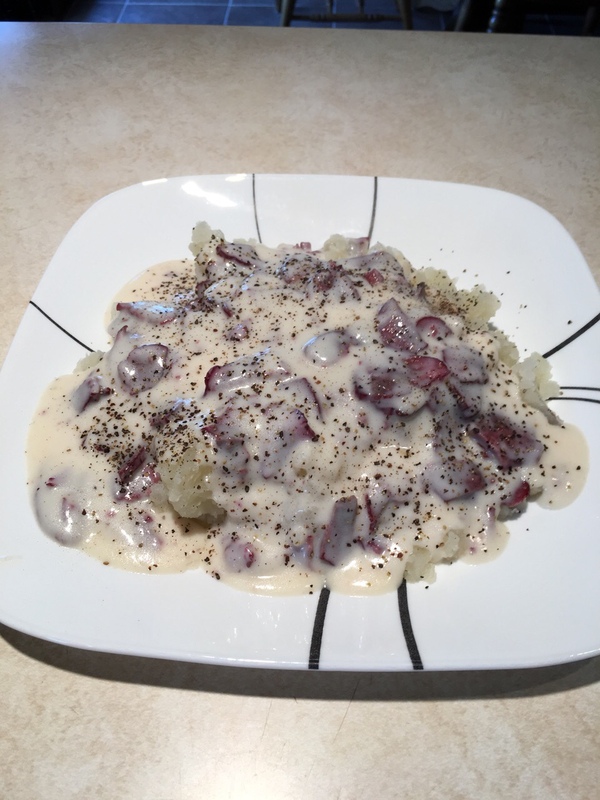 It makes for excellent sandwiches or chipped deer gravy on biscuits or mashed tatters. 2.5YR8, Broot, goatman and 2 others like this. I dated a gal whose dad owned a locker, the main reason I stayed with her as long was her dad made dried beef, so it was free. This looks like I'm going to have to try it. Used to have some made at a locker in NW Iowa. What is the CPB that you sprinkle on? 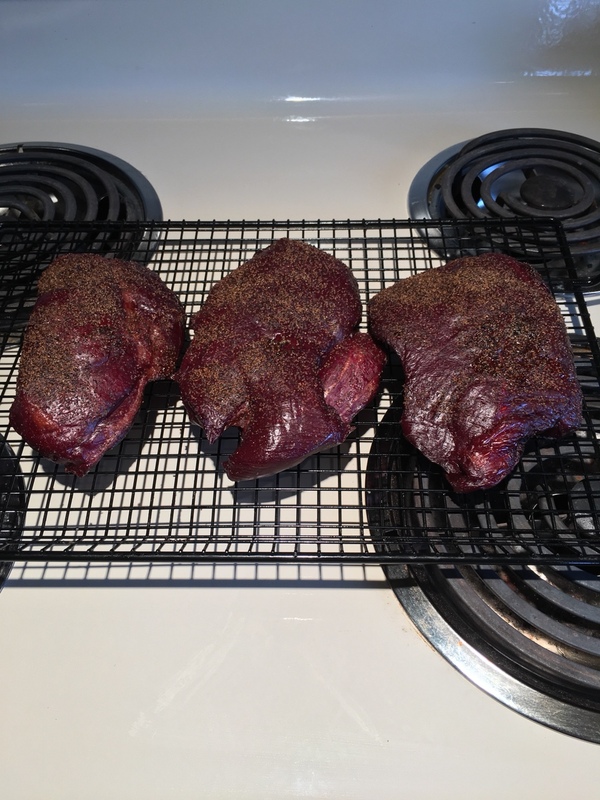 Looks awesome, I love dried beef/venison during hunting trips. May I ask what the CBP is that you sprinkle on after the 8-9 days with the tender quick & brown sugar ?? The TC and sugar is all that’s needed to dry cure meats. You can put other spices in during the cure if you want to. The sugar tones down the saltiness of the meat. If you like it more salty decreases the sugar or increase the sugar for more sweetness. Keep notes on your cure so you can adjust on the next cure. If you make this once guaranteed you will make it again. Curing can be a slippery slope if not done properly and you can get sick from it. Cure has nitrates and to much is unsafe so follow the directions with the proper amounts of cure for the weight of the meat. Give it time to cure properly and make sure your fridge is at optimum temps. I always cut into the center of the meat to make sure the cure penetrated to the middle. The middle should be a bright pinkish red color. 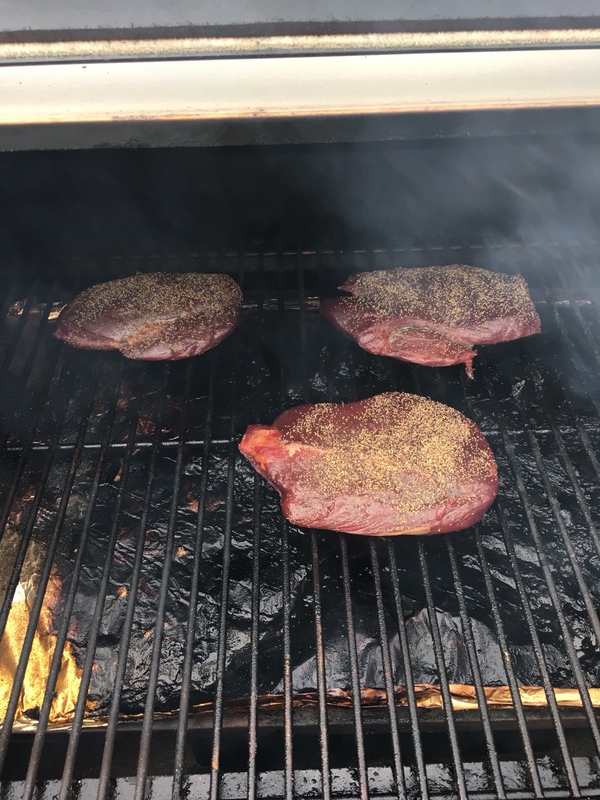 There are two ways to smoke meats. One is cold smoking and the ambient temps are much lower (90-120 degrees) and can take up to 24 hours for the meat to reach 100-120 IT. If using the cold smoke method and the meats not cured properly bad things can happen. I’ve been doing the Hot Smoked method. I set the pellet grill at 180 degrees and bring the meat up to safe temps before pulling it off the grill so the bad things hopefully won’t happen. Just follow the basic rules and you’ll be enjoying your cured meats. Gave this a try and it hit the smoker this weekend. Oh My.... I can't believe I haven't done this before, but this is a crazy good recipe. Had to get it in the freezer or it would be GONE. Not too salty, not too sweet. Kids wanted to make sandwiches for their lunch for school. I wouldn't let them.... They can help make it next time. I just did a couple of lbs this time, but I will be finding a few roasts to do this with again very soon. Thanks for the recipe Ishi! Can you take a roast that has already been frozen, thaw it out and do this with it? Yes you can! I probably won’t get around to making any till next summer. Thaw it out in the fridge and once its thawed then you can start the magic. I involuntarily licked my computer screen. You can speed up the cure time by injecting the meat with a stitch need. It is a long needle with a bunch of holes in it. The directions we use is 7 days in the fridge after injecting the cure and coating the outside. Then in the smoker at 135 degrees with no smoke for 12 hours, then 160 with smoke for 2 hours then 180 until the internal temp is right. 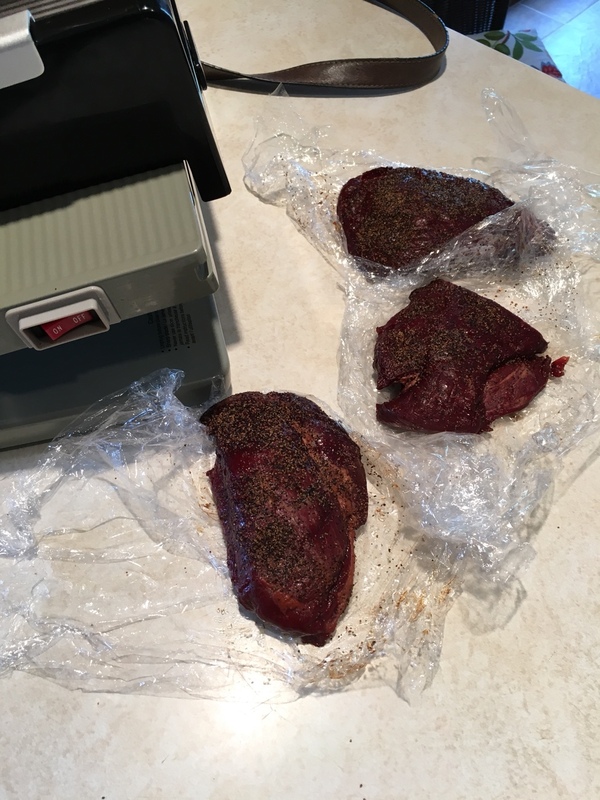 We use the sirloin tip roasts, my buddy calls them football roasts because of the shape. I have a loin roast in the freezer that needs something done with it. 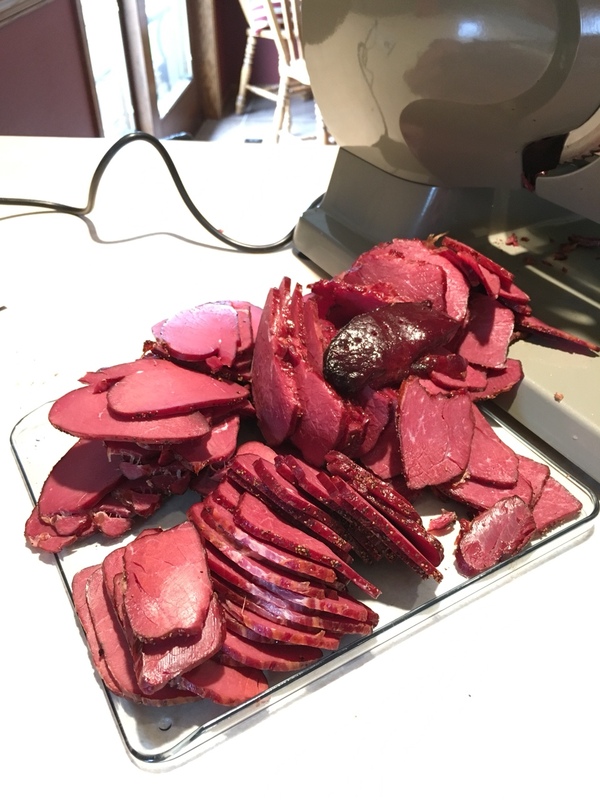 Was thinking pastrami...maybe it will turn into dried venison instead! Loin is in the fridge curing as of last night. Will try to post results when it's done! Side note I have received PM on where to get Tender Quick. Fareway has it and I think I’ve also seen it at HyVee. So it cures in back strap form? Slice AFTER 7-8 in fridge? Yes if meat isn’t over 3 inches thick which most back straps aren’t that thick. Yes the electric will work fine. I smoke at 180 degrees at that temp figure at least 5 hours but keep checking the meat. The meat can stall after 5 hours to get to temp if that happens I turn the heat up to 200 degrees to finish it off.